Wenger has said he wants to return to work in January. UNDER-PRESSURE Bayern Munich boss Niko Kovac has received a vote of confidence from chief executive Karl-Heinz Rummenigge. Kovac, 47, succeeded Jupp Heynckes in the Bayern hotseat in the summer but the Croatian has found it difficult at the Allianz Arena so far. Bayern have won the Bundesliga title in the last six seasons but already face a battle to retain the championship under Kovac’s guidance. The German outfit are currently fifth in the table and nine points behind league leaders and rivals Borussia Dortmund. Bayern have impressed in the Champions League, winning four and drawing one of their five Group E matches, but that has not stopped speculation surrounding Kovac’s future. Former Arsenal manager Arsene Wenger has been linked with replacing Kovac, but Rummenigge insists the club wants the ex-Frankfurt coach to remain in charge for a number of years. In an interview with AZ, Rummenigge said: “The wish of all us at FC Bayern is to collaborate with Niko Kovac for a long time. “It’s my wish that he not only is our coach at Christmas in 2018, but also in 2019 and in 2020. 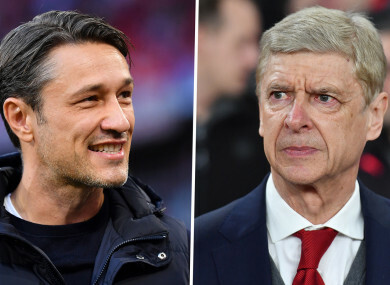 Bayern’s public backing of Kovac comes after Wenger dodged questions about the speculation linking him with the Bundesliga giants. But expanding further on his desire to coach again, the Frenchman added: “I still have dreams. No, it’s not over [my coaching career]. “There are different ways to work as a coach, I can also train young players. But I’m still fit. I still want it. Bayern are back in action on Saturday when they travel to Werder Bremen in the Bundesliga. Email “Kovac receives vote of confidence as Wenger coy on Bayern talk”. Feedback on “Kovac receives vote of confidence as Wenger coy on Bayern talk”.